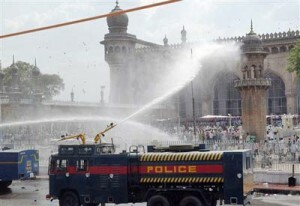 Civil Liberties Monitoring committee express its deep distress on the occasion of 11 years of Makkah masjid bomb blast and subsequent police firing in which many people died and more than hundreds were injured. It should be remembered that on 18th may 2007 a powerful bomb exploded by the hindutva terrorists in Makkah masjid during the Friday prayer, immediately after that police started firing on unarmed people with the intention to kill them and within minutes Telugu electronic media started scrolling news blaming that Muslim youths are responsible for blast and then started stories that a Muslim youth exploded the bomb by operating it from Bangladesh.it is matter of fact this is the first case of terrorism which was live telecasted on tv9 telugu news channel. Blasting, firing, and media propaganda against Muslim community was like multiple terror attacks with a clear intention to develop a fear complex and demoralised the whole community. 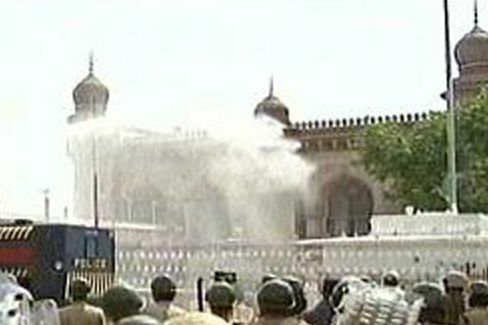 Makkah masjid bomb blast and subsequent police firing and propaganda against Muslims, implicating Muslim youths in terror charges and acquittal of hindutva terrorists from the court by stating lack of evidences, and the immediate resignation of the presiding judge made this terror attack as a strange case of terrorism and a unholy nexus can be seen in-between state and non-state factor which resulted in the denial of justice to the Makkah masjid blast victims. On this 18th may 2018 it is completion of 11 years of multiple terror act in which makkah masjid and whole Muslim community was under attack. Still Muslims have not overcome from the shock, trauma and suffering. Still it is fresh in the minds of Muslims and particularly victims of blast, firing and police torture whom have suffered and continue to suffer a lot. They strongly believe state and its agencies, prosecution and court are non-serious to provide justice and not interested to punish the criminals as per the law of the land, instead criminals of terror enjoyed the leniency of state with impunity and it is also a known and open fact now a days that the policy of the Govt is to go soft on the hindutva terrorists. The investigative agencies of government have been not serious and sincere enough about the investigation of this incident and have long ago lost interest to bring criminals under justice, which reflected in the whole botched up prosecution conducted inside the court. The NIA consciously sidelined crucial material evidence during the trail to facilitate the acquittals of Hindutva terrorist, the way which these investigative agencies are working clearly reflects that they are working under the pressure of Hindutva government where in it has now become the official policy of the government to go soft on the Hindutva terrorists. And if this current state of affairs continues then citizens will lose confidence from the investigating agencies and judiciary. After 11 years of Makkah Masjid bomb blast and firing and acquittal of Terror criminal from the court it has become a strange case of terrorism which is leading to many more uncomfortable questions arising in the mind of general public. After the court’s impunged verdict again the unanswered questions arises as to who were the local Hindutva terrorists who provided logistical support in planning and carrying out blasts! It is also a mystery till now as to why the police opened the fire on the innocent people at Makkah Masjid who were already victims of the blast? Why the media blamed the Muslims immediately after the blasts without any proof by giving the references of police sources? All this aspects remained under covered and it has to be still disclosed by the investigative agencies. Overall it is a greater conspiracy to target the Muslim identity, to defame and demoralize the Muslim community. On the completion of 11 years of blast and after aquital of terror crimnals from the court this committee demands the government of Telangana to start the judicial procedure to conduct the retrial of Makkah Masjid bomb blast case in free and fair manner and provide justice. It is the responsibility of the NIA to take this case seriously as it has taken up other blast cases and conducted trial in fast track court and brought criminals of blast under justice. This committee demands the state government of Telangana to expose the Hindutva terrorists who extended logistic support for the blasts and to take appropriate action against them to stop further attacks on Muslim community. We appeal to the people of India to realize the increasing fold of Hindutva terror with impunity and to combat and resist it to save the secular and democratic fabric of India.